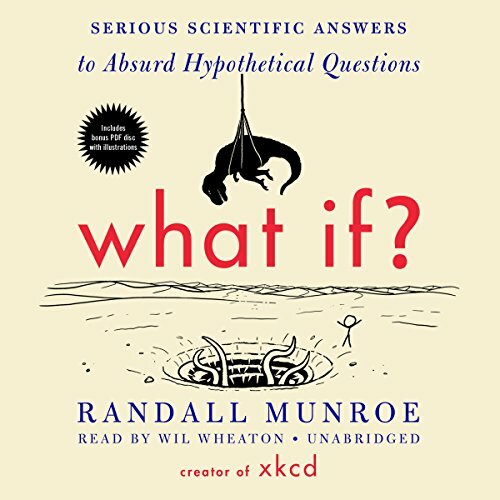 From the creator of the wildly popular webcomic xkcd comes this hilarious and informative book of answers to important questions you probably never thought to ask. Millions of people visit xkcd.com each week to read Randall Munroe's iconic webcomic. His stick-figure drawings about science, technology, language, and love have a large and passionate following. Fans of xkcd ask Munroe a lot of strange questions. What if you tried to hit a baseball pitched at 90 percent of the speed of light? How fast can you hit a speed bump while driving and live? If there were a robot apocalypse, how long would humanity last? In pursuit of answers, Munroe runs computer simulations, pores over stacks of declassified military research memos, solves differential equations, and consults with nuclear reactor operators. His responses are masterpieces of clarity and hilarity, complemented by signature xkcd comics. They often predict the complete annihilation of humankind, or at least a really big explosion. The book features new and never-before-answered questions, along with updated and expanded versions of the most popular answers from the xkcd website. What If? will be required listening for xkcd fans and anyone who loves to ponder the hypothetical.